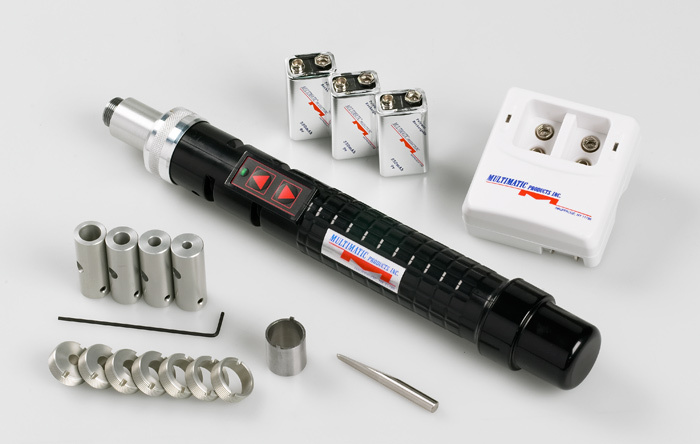 This is the complete kit offered by Multimatic Products Inc. for all of your rotary thread inspection needs. It comes with three 9v batteries and a charger for continuous inspection operation. 4 ea. Taper Lock Attachments for gage tapers 0, 1, 2, and 3. Thread Gages are not included. Can be supplied. Prices upon request. Please note that the Rotary Thread Gage Inspection Tool only fits Gages with Taper Lock sizes 0, 1, 2, 3. The included Taper Lock Attachments will accommodate thread gages #8 (4mm) through 3/4″ (19mm). For smaller thread gages Taper Lock Attachments can be supplied. Price upon request. These files are free to use for any press, editorial, or promotional purposes. For commercial uses, please contact Multimatic Products Inc. before publishing. NOTE: These files are extremely large (25-40 MB) .tif format files that may take a some time to download. Right click on photos and select Save (Download) Linked File As from menu.